a medium density, dry-process insulation board, suitable for sarking insulation or for internal rendering. high compressive strength boards, perfect for confident counter-battening. ideal for forming a warm roof which is completely vapour permeable with good thermal mass and acoustic insulation. Image description: This shows the T&G profile on the edge of the Beltermo Ultra. Image description: This is a close-up of the surface of the Beltermo Ultra board showing the texture. On top of your rafters, preventing thermal bridging and keeping noise out, especially for loft conversions. Behind any cladding on walls on timber frames or masonry. As an internal plaster carrier. Beltermo Ultra is suitable for pitched and flat roof constructions. The Beltermo Ultra wood fibre insulation sarking boards should be laid on top of the rafters and fixed in place with counter-battens. For roofing applications the first row should start at eaves level and working in rows, work your way up the roof. To reduce waste the overhang from the first row should be trimmed off and used to start the second row and so on. For use behind cladding the same principles apply. When working on masonry structures, unless the wall is very flat, timber battens should be fixed to the surface first with SteicoFlex flexible wood fibre insulation between the battens. 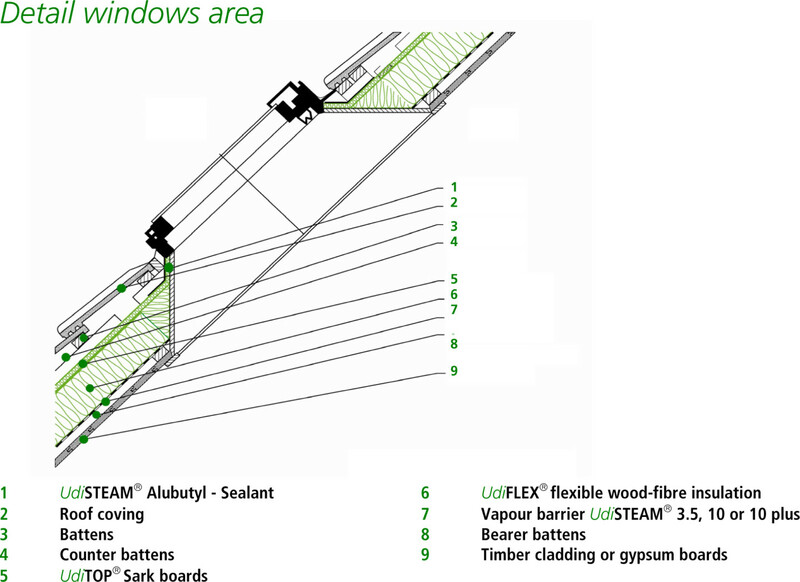 The Beltermo Ultra can then be fixed to these battens, avoiding any voids behind. Alternatively, apply a levelling plaster to the surface of the wall, texture with a knotched trowel and fix the boards to the surface whilst still wet. Any cut joints or corners can be taped with Ampacoll XT tape to ensure weather-tightness. Boards are not suitable for walking directly on unless supported underneath. For installations where the Beltermo Ultra will be left exposed for more than 4 weeks or where metal roofing is to be used, instal Ampatop Aero breathable membrane over, prior to fixing of the counter-battens. The Beltermo Ultra wood fibre insulation sarking boards typically cover an area of 1870 x 570mm (1.07m²) but the exact board sizes vary slightly, depending on their thickness. The 40mm Beltermo Ultra boards are smaller, 1230 x 580mm and cover 0.7134m². Allow 5-10% wastage depending on the complexity of the roof/facade. Any cut joints or corners can be taped with Ampacoll XT tapeto ensure weather-tightness. Unfortunately we don’t have any photos of this product in use at the moment. Beltermo Ultra wood fibre boards cost as per the below individual prices with a discount of 10% on full pallets. Carriage is typically calculated at £130 + VAT per pallet and all orders will be sent on a pallet. This price does vary if delivery is required to remote locations. We are also able to stack pallets in some cases. If you require only a few boards we may be able to get slightly cheaper shipping so please contact us for a more accurate price.